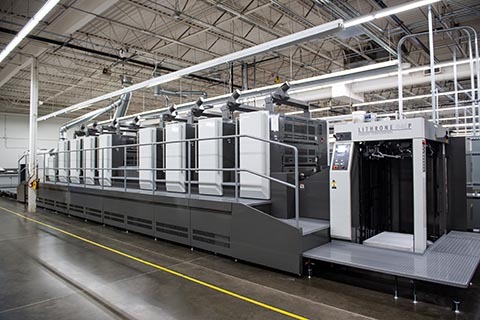 Rolling Meadows, Ill. – Komori America announces that Daily Printing, a leading provider of quality printing and marketing services, recently purchased an eight-color Komori Lithrone G40 perfector (GL840P) with H-UV. By consolidating the pressroom and replacing three older competitive presses, Daily Printing will benefit from increased quality, throughput and overall efficiency. Since its inception in 1950, Daily Printing has remained at the forefront of the industry by utilizing the most advanced technology on the market. The company’s recent investment in the Komori GL840P reinforces this commitment and allows Daily Printing to deliver high value printing and a quicker turnaround time to customers. The company is taking full advantage of the GL840P’s automatic devices and systems, such as the KHS-AI integrated control system, its full automatic plate-changing system (APC) and the ability for printed items to cure instantly with H-UV. With specialized direct mail as one of the company’s primary offerings, the ability to print on difficult stocks, like uncoated or matte, and to create special effects and embellishments with specialty UV coatings and reticulating varnishes were additional deciding factors in the purchase of the GL840P. Additionally, Daily Printing invested in Komori’s new cloud-based program, KP-Connect, that gives visibility into the pressroom from any mobile device. Providing press operating detail as well as job detail from an easy-to-access dashboard is helping the company use data analytics to analyze and refine productivity.